Toby, a 9-year-old gelding, died after neglect, police said. One horse has died and another is reportedly recovering after a South Jersey woman allegedly neglected them for several days during the brutal cold, police said. Burlington County SPCA Humane Police discovered the emaciated horses – Toby, a 9-year-old thoroughbred gelding, and Sunny, a 28-year-old gelding – at a Mansfield farm on Feb. 20, authorities said. 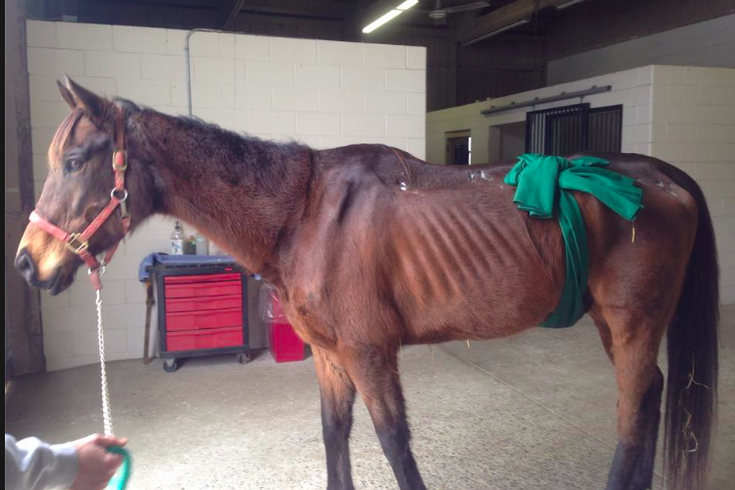 Sunny was relocated to a new home, but Toby was rushed to the New Jersey Equine Clinic in Millstone and became the center of an extensive social media campaign by the humane police to raise money for surgery for a frostbite injury. For days he fought to survive with the help of donations from area residents. Toby went through a second round of emergency surgery but was unable to recover. He was euthanized late Monday, authorities announced Tuesday. The owner, Kelly Schreiber, 45, has been charged with multiple offenses of animal cruelty, police said.